This is the stage of the fantasy season where many competitors who compete in roto leagues become mindful of their innings caps. Some team owners have more innings left than others. For this reason, it’s often wise to look at a category like strikeouts in a different perspective. You might have 850 strikeouts and your chief rival might only have 830. But don’t be certain you have the advantage. If that competitor of yours has more innings left to be pitched than you do, he can get more starts from his pitchers over the stretch run of the season and make up the gap. One of the best ways to check your upside and downside in strikeouts is to treat it like a rate category. Take your team’s strikeout totals, multiply it by nine, and divide it by the number of innings accrued for your team to date. For a team with 850 strikeouts over 1000 innings, that translates to a K-per-9 rate of 7.65. Do the same for all your competitors. This will give you a better sense of how the standings in that category might move as some teams pitch more and other teams pitch less over the final six weeks. 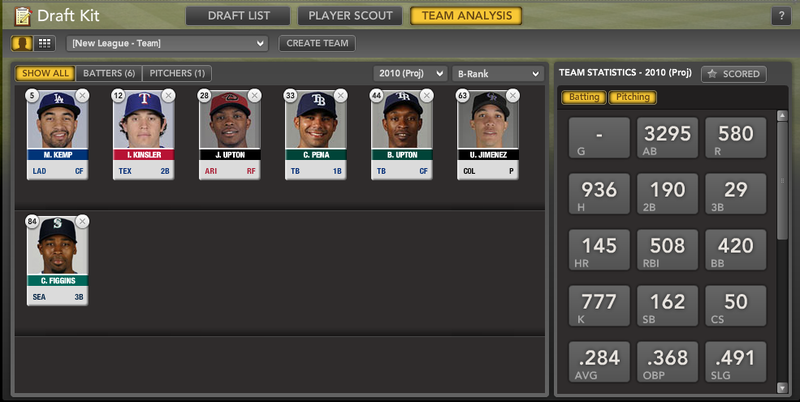 If you find your team wanting, it may be time to look at options that will boost your team’s strikeout rate. With a dwindling number of innings, the goal becomes to maximize the efficiency of those innings. Which brings us to Jorge de la Rosa, who despite an ugly ERA at 4.99 and a woeful WHIP at 1.48, offers something that few pitchers can claim to do at this point of a season: The potential to move the needle in the strikeout category. Jorge de la Rosa’s strikeout rate is 9.24 per nine innings this year. It was 9.39 last year. Bloomberg Sports projects a conservative 8.8 over 55 innings the rest of the year. If we use de la Rosa for 55 innings on the way to the maximum instead of an alternative pitcher with a 6.5 K rate, what does that do to the team’s overall strikeout rate? I’ll spare you the math, but the answer is that our team increases its season strikeout rate from 7.20 to 7.29. It would be enough to gain four points in this particular league. Still, in making final roster decisions heading into the home stretch, it’s helpful to do a closer inspection of the state of the standings by considering that teams often sit on unequal ground. In leagues where active teams all chase a specific innings goal, the distinction between a counting category and a rate category is rather illusory. Innings is merely a denominator that gets wiped out after teams arrive at a similar endpoint. But along the way, because each team has its own pace, it’s useful to measure a team’s efficiency along that journey. Maximizing a team’s strikeout rate by using a pitcher like de la Rosa could translate into a big stretch run and a fantasy league title. counting stats in the early rounds. higher than his perceived value. Beckett – but without an ace’s price tag. among non-Colorado teams in the NL West. pulled the trigger on Jimenez. the NL West. Jimenez teammate Jorge de la Rosa, another top-10 finisher in NL strikeouts last year, could be a great late-round snag to round out your staff. 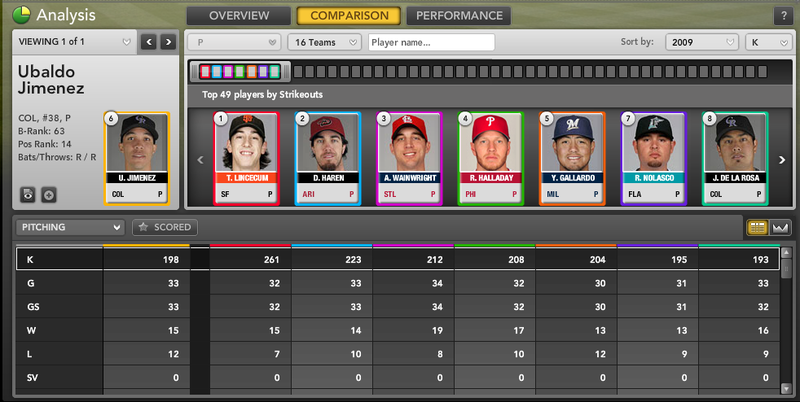 For more information on Ubaldo Jimenez and hundreds of other players check out Bloomberg Sports’ fantasy tools.